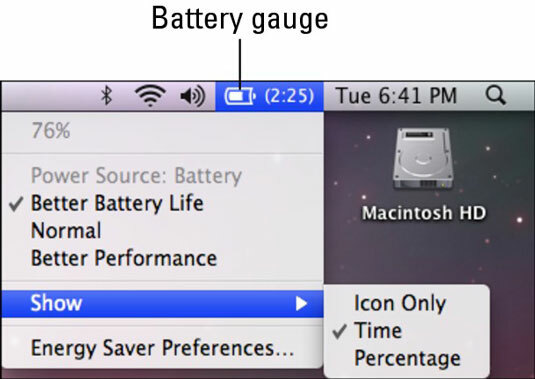 You Mac laptop’s actual battery life will vary, depending on how you use your computer. Expect the time your laptop’s battery works between charges to be less than the manufacturer’s claim. You can, however, take steps to boost your battery’s longevity. The battery gauge gives you a decent measurement of how long you can work before your battery dies. You can display this gauge by time or percentage. Just click the menu bar icon, choose Show and then choose Icon Only, Time, or Percentage. Dim the screen. Press F1 on the keyboard to turn down the brightness. Open Energy Saver by single-clicking the battery gauge in the menu bar and then selecting Open Energy Saver. 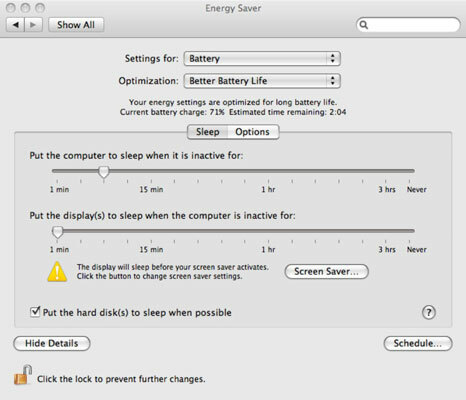 Near the top of the window, choose Better Battery Life from the Optimization pop-up menu. Also, make sure to check the Put the Hard Disk(s) to Sleep When Possible option. Other options in Energy Saver let you put the computer to sleep when it’s not used for a certain period or put the display asleep after the machine is inactive. If you click Schedule, you can determine when the computer starts or wakes up or goes to sleep. Click Show Details if these options don’t show up. Shut down the AirPort wireless networking feature if you’re not surfing the Internet or sharing files over the network. AirPort hogs power. Turn off the wireless settings for Bluetooth if you’re on a plane or if you want to save battery power. Rechargeable batteries have a finite number of charging cycles, so even with the best feed and caring, they have to be replaced eventually. You’ll know it’s time because the battery will no longer hold a charge. You may routinely keep the computer plugged to recharge the battery. However, Apple recommends pulling the plug periodically to keep the battery alive. If you don’t plan on using the computer for six months or more, remove the battery and store it with about a 50 percent charge. You may not be able to recharge a fully discharged battery that has been kept on the sidelines too long.